OAKLAND – Qualifying for the U.S. Women’s Amateur Championship took place Thursday at Sequoyah CC with eight players advancing on to next month’s championship. Leading the way with a score of one-over-par 71 was Mariko Tumangan of San Jose. The 19-year-old started her round off the right way with a birdie at the first, but dropped a couple shots with three bogeys and another birdie to make the turn at one-over-par. Then on the back nine Tumango played level-par golf making two birdies on Nos. 12 and 18 and two bogeys on Nos. 13 and 16 to post a 71. Lucy Li, 10, was one of eight players to qualify on Thursday. Finishing right behind Tumangan at two-over-par 72 and alone in second place was Grace Na. The Oakland resident who started her round on the 10th opened with a birdie on the 11th before bogeys on Nos. 13 and 15 to turn at one-over-par. Na then opened her back nine with a birdie on No. 1 to get back to even-par, but then went on to make two bogeys on Nos. 5 and 9 to finish at two-over-par. Tied for third place at three-over-par 73 were Anna Zhou and Grace Park. Zhou of Palo Alto had three birdies and six bogeys in her round, while Park of San Jose had four birdies and seven bogeys. Tied for fifth place at 75 five-over-par were Yumi Matsubara of Osaka, Japan and Lucy Li of Redwood Shores. Matsubara had a very volatile round, one that included an eagle, three birdies, six bogeys and two double-bogeys. 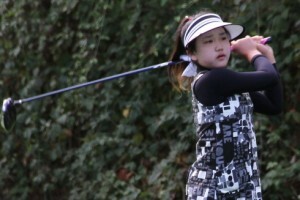 Li, the 10-year-old golf prodigy, had two birdies, five bogeys and a double-bogey in her round. The final two players to qualify, having to do so by sudden-death playoff, were Spencer Heller of Turlock and Paige Lee of Folsom, who both tied with three other players at six-over-par 76. Heller and Lee both qualified after the second playoff hole, while Laura Hoskin earned first alternate and Marika Liu earned second alternate. The eight players qualify to participate in the 2013 U.S. Women’s Amateur Championship, which will be held at the CC of Charleston in Charleston, S.C., August 5-11.